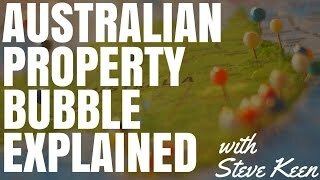 In today’s episode economist Steve Keen explains why Australia is in a property bubble and what you can do about it. Is there currently an Australian property bubble? Some experts say that there is and that prices in property could fall by as much as 40% or more. While other experts say that we aren’t. Today, I have with me an expert in the Australian property bubble, an economist, Steve Keen, who understands this issue like nobody else. I was really excited to get him on and to understand why he believes that we are in a property bubble in Australia, to talk through some of the statistics and to also really get an idea of is this bubble likely to pop in the near future and what can we do about it as investors. I’m really excited to have this interview today on whether or not Australia is experiencing a property bubble and what we can do about it. I do want to apologize ahead of time for the quality of the recording. The internet at my house wasn’t performing very well when we did this and we’re talking to each other on the opposite sides of the world. Unfortunately, there are some areas where the audio cuts out or it’s not too strong and the video can be quite pixelated. So just beware of that, I do apologize for that, but there wasn’t much I could do. But this definitely an interview worth watching. Steve: Okay. Let’s see if it works with me calling you. Steve: Share screen. Start. Let’s see. Ryan: Alright it’s just loading. Ryan: Okay. Yup, I can see it. Steve: Okay. That particular graph is what I’m calling a smoking gun of credit. So the red line is GDP. The blue line is GDP plus change in debt, which is basically credit – plus credit. And the black line is credit graphed on the right hand side. Okay. Whenever the blue line’s above the red line, credit is adding to demand. When it’s below the red line, because people are paying off debt more than they’re taking on new debt, credit’s reducing demand – credit’s negative. Ryan: Which basically never happens on this graph. Steve: Well, it never happened in Australia so let’s take a look at the American, just give me a sec to get to the right part of it. Right chart here. This is all charts for a book I’m writing right now on the topic. I’ve got to change that. That’s the UK. Where’s the USA? This will give you just as Australian in private debt. This is when I started calling the crisis to understand why. So the dotted line’s the exponential fit to the Australian data and the American data in ratio of private debt to GDP. Steve: See the trends? Okay. Steve: So exponential increase ratio of debt to GDP. It’s not the actual level. So here’s the chart from America. Same when I showed you for Australia a minute ago. Steve: Where you have the GFC maximum boosted demand coming out of credit being positive and then it plunges. And for quite some time, it’s negative, so it’s taking demand out of the economy. So we side stepped that. Australia’s went down to here and bounced up again. And that was because of the impact of the first homeowner’s scheme. These people dived in and took on mortgages. Ryan: Yup. I remember that time. Steve: And they fall. The trend for this to go negative. Yeah. And then the second time, around 2012 when, again, we started having a decline in mortgage debt growth. That’s when people started borrowing for all the investment projects in mining. So it boost kind of the business side. And then, as debt started to slow down, they were actually rising as a percentage of GDP. That’s when investors followed the housing market again. So, consequently, what we have – this is the key one I want to come down to in a moment. The key relationship is – that’s the chart you can see right now. And I’ll explain the logic when we are actually in the interview. But what actually drives the market is acceleration of mortgage debt. So what I’m graphing here, the blue line is change in house prices in America and the red line is the acceleration, not the change, the acceleration of mortgage debt as a percentage of GDP. Okay, can you see the relationship? Ryan: Yup. It seems to be in line with each other. Steve: Okay. Yeah. One drives the other, so econometrics on this then it’s definitely the case. Accelerating mortgage that drives change in house prices. Bryan: Yeah, where the red line preceded the blue line. Steve: Yeah. This is now looking at the – this is real house prices in America versus Australia since 1986. So America had this big bubble and crash and now, some real house prices are still high compared to what they were back in 1986, but not that much higher. Australia’s real house prices have doubled, almost tripled over that period of time. That’s the same chart I showed you for Australia a moment ago. Now, what’s been driving it, this is the next chart. This the ratio of mortgage debt to GDP. So guess which one is America. Ryan: I can still see the same graph as before. Oh, wait. Hold on. Alright, Australia is the blue line, obviously and it just keeps going up. And America’s dropped during their burst, basically. During the crash. Steve: Yup. So we manage to avoid that, but only by taking on more debt. So, consequently, at some point, and we’re approaching it now, I think. The growth in debt will stop and when it does, house prices will fall over. The only thing that’s likely to keep them up have been Chinese buying. Ryan: Yup, which is being stunted by the Chinese government, isn’t it? Steve: Yeah and by the Australian government, funnily enough. I thought they would have any balls about that, but they finally got some. Ryan: Okay, cool. Let’s start the interview and we can go through all this during the interview. Just so you know, my audience tends to be kind of newer investors so they might own 1 property. They might be looking to get into the market. A portion of them own quite a few, but the majority of my audience is more entry level investor. Steve: Yup. Okay. How many viewers do you have? Ryan: I’ve got a blog, video and podcast. Combined, probably 150,000 a month. Steve: That’s pretty solid. That’s a good audience. Ryan: It’s a pretty good audience that I’ve grown over the years. Ryan: Okay. So, I will do like an intro before our interview and then we’ll just flow on. I’ll do that when you’re not here, so I don’t waste your time. Yeah? So, I’m excited to have with me today Steve Keen. Steve, thanks for your time today, I really appreciate it. We’re here to talk about the potential, I guess, what you consider the definite property bubble that is happening in Australia. Can we start by explaining to everyone why you think there is a property bubble and what you have to back this up? Steve: Okay. Most people, when you talk about house prices, their instant answer is it’s all a question of supply and demand. And I say, “Okay, I agree with you and I’m going to show why there is a bubble.” which makes me very unpopular. So the usual, if you think about how can you make this supply and demand case is say, well, if it’s supply and demand, if supply is tight, therefore, it’s just demand for housing driving up the price, then that’s not a bubble. That’s the usual logic. Nobody ever goes and explores the demand side and that’s what I do. So, if you look at the demand side, what is the demand for housing? Leaving aside the Chinese buying, which it was an important extra factor in the last 3 or 4 years. Demand for housing is fueled by new mortgages. Most people who want to buy a house, they’re taking out a mortgage for at least 85% of the 95% of the purchase price. So, the new purchases are taking a 95% of the purchase price. They can really regard demand, in money terms, as being new mortgages. Steve: Which is change in mortgage debt. Ryan: You’re saying that because people are purchasing property with a high percentage of debt rather than a larger deposit. They’re using the bank’s money to purchase property, not their own. Steve: Exactly, yeah. Now, in Australia’s case, we’re looking at average loan to valuation ratio to at least, on average, at least 80%. Possibly 90%. So, I’m just ignoring the component that comes from people’s deposits and saying most of that demand you can say is new mortgage debt. Imagine how much demand there would be if people stopped taking out mortgage and used only the cash they had saved. Ryan: Yup. Well, not a lot of demand. It’s pretty hard to – I’m not going to be able save $1 million to buy a unit in Sydney or something like that. Steve: Exactly. Okay. So the demand is new mortgages. How many physical buildings people can buy or apartments divided by the price. So that’s your physical demand. If physical supply is people selling existing properties plus the new properties coming out of the market. Ryan: So you mean new builds. Steve: New builds and stuff like that. So you’ve got a physical number of new builds coming onto of the market. So you’ve got a relationship between the change in mortgage debt and per level of house prices. We’re not going to go through the mathematics of doing the conversions I’ve done, but you can get a relationship fairly obviously. If there’s a link between the level of house prices and the rate of growth of mortgages, then there’s relationship between the change in house prices and the acceleration of mortgage debt. Ryan: Okay. So that goes over my head a little bit. So you’re saying that as mortgage debt grows, house prices grow or are you saying that as mortgage debt accelerates in its growth, that house prices grow? Steve: As mortgage accelerates, house prices grow. So then to have maintain rising house prices, you’ve got to have accelerating mortgage debt. Ryan: Okay. Because if mortgage debt stayed the same, then supply would be quite similar. Not supply, demand, I mean. Supply and demand. Steve: Yeah. Demand will flat line. Demand would collapse. If demand is coming from new mortgages so if you have new mortgages, you have that demand. In fact, you need it to be accelerating to be able to get rising house prices. Ryan: So are you saying that the growth in the Australian property market over the last, I don’t know what period, has been because people have been taking on more and more mortgage debt than they have in the past? Steve: Yeah, yeah. The imperial data is overwhelming. It’s one reason I have any influence of debt. I might have a bit of screen sharing here just to, first of all, compare the level of debt in Australia and the level of debt in America because – is that going to be worth doing or not? What do you think? Ryan: Yeah, I think so. Let’s go ahead and have a look at it because everyone is aware of the crash that happened in the US and if we can compare that to Australia, I think that would be useful. Ryan: I’m just going to turn my webcam off because the internet seems to be a bit slow. Steve: Yeah. I’ll start, first of all, with saying that this the chart that got me into making the public warnings I started making back in 2006 about approaching financial crisis around the world. So if you can see what’s on the screen right now, the red line is the ratio of private debt in America to GDP and the black line is the ratio of private debts to GDP in Australia. Steve: When I saw that Australian data, I so gobsmacked, I feel I’ve got to check the American data to see if this is a global phenomenon and that’s the chart that I produced. The 2 dotted lines are the trend in the data, the exponential trend. I just looked at that data and thought, first of all, we’re talking about the highest level of private debt in post-war history. So you can see the American data goes back to 1955. So that ratio – oh, ’52, actually. We’re looking at the highest level of private in post-war capitalism and Australia is actually not as high in the data, but growing much more rapidly. The crosses has to occur and that’s when I started warning about the crisis. Now, bear with me for a second, I’ll have to flip through a few screens here because I know the chart that I want to show is a few charts. This is all for work for a new book I’m writing which will be coming out, hopefully, in about September called “Can We Avoid Another Financial Crisis?” and it’s a book on the global economy, not just Australia, obviously. So this is looking at my analysis of what causes a crisis. And that is the total demand in the economy is not just GDP, it’s GDP plus credit. And that’s also the technical issues I’ve come up with that they get me involved in a debate with mainstream economist and even my own non-mainstream economists I’ve done the mathematics. I’m very confident of my argument here. Ryan: So can we just explain this? Are you saying that – so GDP is like how much a country earns. Is that as simple way to explain it? Steve: Yeah. Simple way to explain it. Ryan: You’re saying that when you’re looking at a country and you’re looking at the economics of that country, you need to look at the GDP and how much that country earns as well as how much debt they’re acquiring because, obviously, if they’re acquiring debt, they can use to spend on things like houses or personal things. Steve: Exactly, exactly. And economists believe that that’s doing double counting. I’ve proven that it’s not because what they think is when you borrow money – if I borrow money, they tend to think I’m borrowing it from you so you can spend less and I can spend more and the two cancel out. When you look at bank lending, banks don’t have to get deposits to lend. They’re lending actually creates deposits. Therefore, the extra demand coming from credit is added on to the demand from incomes themselves. Some complicated issues there, but that’s the basic logic. So with that logic, I started drawing charts like the one you can see on the screen right now. The red line is America’s GDP, the blue line is GDP plus credit, which is the change in private debt. And the black line which is graphed on the second Y-axis there is just the change of debt in that time. And I was saying back in 2006 that it’s going to be a crisis when the rate of growth of debt starts slowing down and I thought it would happen both in Australia and America and other countries around the world where I didn’t have data. As you can see, that’s what happened in America. The crisis began when the rate of growth of debt started to slow down. And for some time, change in debt was actually negative, so credit was negative. So, for the depth of the downturn they went through, people were reducing the private debt by up to about almost $1 trillion a year at an annual rate. And that dip is when America had a serious crisis from here. When gross debt was growing at $2 trillion a year, down when it was falling by $800 billion a year, that was the serious crisis. Then it began to turn around, they started borrowing again. That’s the American data. Ryan: So are you saying that a reduction in debt – did that happen because of the property crash in America or did that precede and kind of caused the property crash that happened in America? Steve: The property crash preceded the house problem. You will see another chart coming up on screen in a moment. Because the argument for demand for housing being new mortgages, so change in mortgage debt. It affects house prices. Therefore, the acceleration of debt sets the change in house prices. So to have rising house prices, you have to have accelerating debt. Ryan: So effectively, if debt stagnates and just stays equal so it’s not accelerating, then could that cause like a slump in the market because you’re getting increased supply, but you’re not getting increased debt? Steve: Yeah. And you can see this in the American data. Take a look at the – the blue line there is the annual change in house prices after inflation. The red line is the acceleration of mortgage debt. I’ve done the econometrics on this and mortgage debt causes change in house prices, not the other way around. Ryan: So you can see the acceleration of mortgage debt basically almost influences the real house price change like with a delay of like a year or something like that, is it? Steve: That’s about 2 or 3 months delay. Now, what you get out of this is the house price fall in America began before the global financial crisis. You’ll see I’ve got a dotted line there marked GFC. That’s August 2007, which is when the crisis began. So the fall in house prices and therefore the deceleration of mortgage preceded the crisis itself. So the acceleration will turn faster than velocity does. So you get the fact that the actual cause of the crisis was deceleration of mortgage debt. It caused the crisis because the level itself of debt in general is so high. So what you had, which is the next chart coming up on screen, I think it’ll take a couple of seconds to turn up there. Ryan: Can I just ask? What did mortgage debt decelerate in America to then cause that crash? Steve: Well, the only way you can not decelerate is if debt continues rising faster than income forever. Okay? Ryan: Okay. Which doesn’t sound feasible. Steve: Which isn’t feasible. So if you want to just to get a rough sort of stylized view of what can happen, imagine you’ve got a minimum level – let’s say it’s 20% of GDP. And let’s say a maximum of even 200% of GDP, which is far bigger than the level they’ve actually reached. If you draw a line between the two, or a curve between them, what you can get is like an extended S-shaped curve. The maximum rate of change of that debt is where you get the inflection point in the S. And then, the acceleration is going to be before that point. So, simply the fact that coming from a minimum level to a maximum level, you’re going to reach a maximum velocity in the middle between the two and then slow down. Ryan: Okay, yeah. You’re slowing down towards the maximum point. It’s like kind of if you throw a ball up in the air, it’s decelerating. Before it hits its peak, it’s already decelerating because of gravity. Steve: Exactly, exactly. So and like if you throw it from at equals maximum acceleration is from the point you actually hurl it. But in the case of something like in a car and you floor the accelerator in a car. Then, for a while, you’re going faster more quickly. Then you reach your maximum rate of acceleration. At that point, you’re getting faster, but you’re getting faster more slowly. And finally, you reach maximum velocity. At that point, your acceleration is zero. So you’ve had a peak and a fall in acceleration before you reach maximum speed. So that’s the reason why these things can be so deceptive because it’s actually an acceleration factor and acceleration is complicated for people to get their heads around. Ryan: Okay. So you’re saying that house prices or like growth in debt – we’re talking about growth in debt or house prices. So say I’m in a car and I’m flooring it on the freeway and I reach 110 km/hr, which is the max speed here in Australia. And then I let go of the gas, I’m still obviously moving forward towards my destination. Is that the equivalent of – like that movement forward, is that the equivalent of growth in house prices? Or you talking about that’s the equivalent of growth in mortgage debt or acceleration of mortgage debt. Steve: It’s equivalent in rise of mortgage debt. Because that’s driving the whole thing, you’ll get the change in house prices will follow not your speed of the car, but the acceleration of the car. So once your acceleration starts to slow down, you might be a maximum acceleration of say 1m/s/s, you know? But you’re getting 10, 20, 30, 40m/s drive speeds. When that goes from 1m/s/s starts becoming 0.5m/s/s, at the turning point of acceleration, that’s when your house prices will start to fall. Ryan: Okay. And so, how do we, as everyday investors, keep tabs on that and even know when that’s happening? Steve: Well, you can actually – my website has that data on it, but I’ll just give your people an idea of just how big this has become in Australia and why it’s so potentially dangerous. I’ll go back to sharing screens again. I want to show you this chart here. This is your level of mortgage debt compared to GDP in Australia and America. And you can see if you go back to 1990, we had about 20% of GDP as a mortgage debt level, they had about 45%. We reached equality in roughly in 2000. When the prices hit, they started to slow down and then fall. They peaked at about 75% of GDP as a mortgage debt level and we were about at the probably 80% mark. Now, America’s mortgage debt is about 50-55% of its GDP and ours is 90%+. So that much additional debt’s been added to maintain the house price rise in Australia. Now, I’ve got to muck around with quite a few charts. This is work that I’m doing for a book so I haven’t quite put it all together properly yet, but here’s the chart that I want to show. This is looking at the – I’ve showed you the acceleration of mortgage debt in America and house price change relationship there. Now, people can say Australia is different. Well, no, it’s not. This is the Australian data. And it’s not quite as strong as the Americans in terms of the link, but you can see mortgage acceleration is driving house price change. From 2012, which is when this new bubble took off, right up to now, acceleration has been getting higher and higher. So the red line is mortgage acceleration. That’s been what’s driven house prices up since 2012. Now, at some point, and I think it’s happening right now, that acceleration is going to start slowing down and that’s when the house prices start falling. So we’re seeing that turning up on the Australian data right now. This data is 3 months old. This goes back to September of last year. Actually, I think it’s only September that I’ve got the house price change up to. So I’m using the data that the Bank of International Settlements puts together to have comparable house prices around the world of house price emphasis. We are clearly still on the accelerating phase there, but if you look at the most recent data, it’s turning, slowing down we’re seeing. Therefore, there’s falling demand and therefore falling prices. Ryan: So, will these changes, the APRA rules that they recently brought in, which I did do an episode about, where they’re trying to, I guess, affect how many investors are getting into the market. Is this going to affect the acceleration of debt and, thus, house prices? Steve: Yeah, it will. This is the classic thing. We have regulators that don’t understand the dynamics I’ve just shown you because they’re mainstream economics trained and their training tells them to ignore private debt. So they’re not even seeing it coming. What they’re going to do now is a bit like they’re shutting the door while the horse is vaulting. So the door’s going to hit the horse on the head. As well as the deceleration finally clicking in and causing house price falls. The regulators are going to make that happen more rapidly. So I expect them to panic at some stage and reverse direction because they don’t want to see house prices fall. So these regulations will encourage further deceleration of mortgage debt and cause the slump in house prices. They’ll be blamed for it, but it’s really, the cause of the whole crisis was letting the level of private get as high as it is right now to begin with. Ryan: Okay. So, in a perfect world, what would have happened? Would have mortgage debt not have risen as much as it did? Steve: Yeah. I mean, Australia’s got all these slots of encouragements people to get in and then speculate on housing. So, if negative gearing, obviously, you don’t have that cost anywhere else in the world. You can write off losses against income from a particular business, but you can’t write off losses from a business against all your other activities, which is what a lot of negative gearing lets people do. We have a capital gains tax that’s half the level of income tax, which if this don’t work, gamble. Much better for you, much better for the country. And then, we have the first home owners scheme, which gives people the depositors, and when Rudd was doubling and tripling of the grant back in 2008. That effectively meant people could have enough of deposit to go and buy a house just from the government money alone, which of course encourages yet more mortgage debt. So all these things have been encouragement of the market and the positive feedback between accelerating mortgage debt and rising house prices had made it look like a good strategy, but the outcome of that is that we’ve got this astronomical level of mortgage debt – the highest compared to GDP in the OECD. And to maintain continued house price rises, we have to have that ratio continue accelerating. Well, that’s not going to do it, at some point, when it stops doing it, it could be well doing it right now, then house prices will fall because of the lack of demand from this new accelerating new mortgage debt and we’ll see house prices coming down and then the government will be in panic. Because, of course, they don’t want a house price crash. But they’ve set it up that it’s inevitable, unless [inaudible 26:12] yet again. Ryan: Okay. So for us, as average investors, what can we do to prepare for this potential downfall? Both if we own property, is there ways to mitigate our risk versus if we’re thinking about getting into the market, how can we assess this and whether or not we should get into market? What can we do to protect ourselves if and when this happens? Steve: The only way to protect yourself from this sort of thing is to reduce your leverage. That’s all. If this happens and you’re levered, then you’re wiped out. If it happens and you’re sold out of the market or you’re not levered, then if you still have properties, the fall doesn’t bankrupt you and you still have cash flow. But if you’re levered and it goes down, then cactus. So the only individual thing can do is to get out of debt. Ryan: Okay. So, basically, you’re saying if you get out of debt or if you own your properties outright, if they go down in value, well, you still own your properties. But if let’s say you have 100% mortgage on that property – or let’s say 90%, you’ve got 10% deposit, if house prices do drop, 40% then you’re actually in the rears by 30% of what the house used to be worth. Ryan: Which could potentially lead to the banks calling your loan and making you bankrupt, is that what you’re saying? Steve: That’s right. People think it’s only going to happen if unemployment rises, you know. And they therefore say, well, as long as the employment’s okay, there won’t be any problem. But the whole dynamics of credit, drive, everything in the economy, including employment and this is what people don’t have their heads around. I’m about to share my screen again when I get the graph up to show the American data. Ryan: While you do that, can I ask you one question? In America, when their house crashed – or across the world, when this has happened in the past because it’s happened in other countries as well, what happened to rents in those areas? Did they crash as well? I’m just thinking if people own positive cash flow property that pays for their mortgage, if a crash happens, will their rents get reduced and they’ll end up in the negative situation? Steve: They won’t fall as much as house prices do. Rent’s really based on incomes, you know? That’s why rents don’t rise as much as prices do in a bubble. They don’t fall as much in a slump. If people lose their jobs and you therefore don’t have the same security of income from tenants, but house prices will fall more than rents. Ryan: Okay. This makes so much sense to me because let’s say I want to buy a house, if interest rates go down, I can afford to borrow more and therefore, if the whole market’s doing that, that pushes prices up. But as a renter, interest rates go down, it doesn’t affect how much I can pay to rent a property. I’ve got an income that I earn, I divvy a portion of that to live and to pay rent and so, yeah, I understand now why rents wouldn’t fluctuate and why they don’t fluctuate in line with the property market and I’ve never understood that. Steve: I’m glad it helped. The catch that people – yeah, sorry. Ryan: I was just going to say do we know how much rents did drop in relation to house prices in previous crashes across the world? Or is that just not a figure people really look at? Steve: It’s a figure I could derive, but it’s not great deal. If you look at the house price crash in America, that was of the order of 40%. I think you would find rents might have fallen by 10%. That sort of thing. Ryan: That’s a massive difference. Steve: Massive difference, yeah. The reason that people say that they’re okay as long as unemployment doesn’t rise, everything’s going to be fine. Well, the relationship I’ve talked about between accelerating mortgage debt and rising house prices is only part of the relationship for private debt. Because, again, credit drives the economy. So, there’s a very strong relationship between credit and the level of employment and this is shown in the American data right now. The red line is the change in private debt, which is credit. The blue line is the unemployment rate. This is going back to 1990. I’m graphing unemployment on one side and GDP on the other, obviously. And you can see that there’s a strong negative relationship. It’s a ridiculously strong negative relationship, in fact. If anybody knows their mathematics, the co-relation between those two series is -0.93. What it says is when credit starts to fall, unemployment will rise and vice versa. So you see the lowest level of unemployment for America, which is when it was down to about 4.5% back in 2007, corresponded to credit being 15% of GDP. Then the GFC strikes and credit goes from +15% to -6% of GDP. Unemployment goes from 4.5% to 10%. Ryan: Is this private debt or government debt or both? Steve: This is private debt. Just private debt. Government debt actually in the opposite direction. Government debt is a bit like an air conditioning system in a hot house. As the hot temperature goes up, the air conditioning turns on and cools the property down. That’s what government debt does, it operates in the opposite direction. The driving force is private debt. Ryan: Yup. Is this just because people are using debt to buy things which fuels the economy, which creates jobs? Steve: Yeah, exactly. So your total demand – your own personal demand. If you go shopping, you can buy something either by using cash you currently got in your bank account so you swipe your debit card or you go get the Mastercard, you swipe the credit card. They’re both independent sources of demand. So your total spending is what you spend with the money you earn, your cash flow plus change in your debt and that aggregates to the national level. It’s important that you understand that. Ryan: Yup. And then if I decide I’m going to be frugal, not only am I no longer increasing my credit or using the Mastercard, I’m now taking my personal money and using it to pay down debt rather than to spend on things, which just leads to lower economic activity. Steve: Exactly, yeah. That’s what happened in America and most of the world. Ryan: This may be a stupid question, but why do we care about unemployment rate and what effect does that have on the property market in terms of house prices or in terms of rental prices? Steve: Well, as soon as people start losing their jobs, and they are, the property market will fall over before people start losing their jobs. This is the causal mechanism actually typically goes from property prices to unemployment in that sense. As the property bubble starts to deflate, because mortgage debt starts to decelerate, that means there’s less demand in the economy because people aren’t taking out mortgages and, therefore, not spending into the economy so there’s less money. In fact, money is being destroyed once people start paying their mortgage debt off. And with that, there’s less economic activity, there’s more unemployment. So the causal mechanism actually starts effectively with the ending of the property bubble. And then, that will cause rising unemployment, which underwrites everybody’s belief that our property prices will remain high as long as unemployment remains low. The falling property prices are a signal that unemployment’s about to rise, which undermines the whole argument. Ryan: Okay. So you’re saying that falling property prices precedes growing unemployment. Ryan: Okay. I guess my question now is in terms of when will all this sort of stuff happen? Steve: Yeah. I think it’s starting to happen right now because the total demand that we get in the economy, that is the sum of household borrowing and corporate borrowing and Australia’s been on a whole series of waves of borrowing since 2010. Because we had both household borrowing to buy property, obviously. But also, corporations borrowing to invest in the mining boom. And the combination of the two meant that the change in credit in Australian went from something on the order of $50 billion a year back in 2010 to $250 billion a year now. Now, of course you can tell that the property bubble is to some extent still continuing, people are still borrowing money to buy housing. But people have stopped borrowing money to build mines. That’s fallen over completely. And now, you’re getting a plunging in corporate borrowing. In fact, corporations are starting to re-pay their debt. So that means, one of those two sources of credit is disappearing. It doesn’t matter where the borrowed money dollar comes from, in effect once it’s in the economy because it’s disappearing from the corporate sector, there’s less demand turning up in the Australian economy in general. And that will mean that demand for houses gets affected by that as well. Ryan: So you’re saying that that’s already happening, like that decrease in corporate borrowing, the companies are paying back their debt. That is already starting to cause decrease economic activity which will affect house prices. Steve: Yeah. Yeah. It’ll feed back into the system and then people will be less willing to take on mortgage debt. For a start, nobody in the mining region of Australia is borrowing money to buy a house right now. Steve: Okay? That’s gone. That’s why we’re seeing massive house prices falls in Queensland and in Western Australia. It’s only in Sydney and Melbourne you’re still seeing a continuation of that, but because now there’s less people buying and mining rigs and importing trucks from overseas and so on with borrowed money, because there’s less of that, we’re starting to see a slow down in credit growth for the corporate sector in general and it will turn negative. The corporate sector will start paying off its debt as it did back in 2008. And then, that’ll take the wind out of the sails before you have the slow down from mortgage debt, but that’s also starting to happen, too, by the looks of things. So the combination of two plunge in credit, we’re going to see a downturn. Ryan: So is there any way to stop this? Is there anything that the government or lending institutions can do to stop this from happening or push it further into the future? Ryan: Does that make it down to 0% interest? Steve: Not for borrowers. That’s the rate that the bank reserve charges other banks to borrow money from it. So the private margin gets added on top of that, so if the reserve rate is 2%, then you’ll likely to find the mortgage rates for about 5%. Whereas, if the reserve rate falls to 0%, then mortgage rates might fall to 3%. That could encourage people to get back into it. Falling mortgage prices, never been a better time to buy yada, yada, yada… People could dive back into the market again and continue borrowing. But, of course, we’re approaching a level where the Reserve Bank hits 0% interest rates. Now, once it gets there, there’s no way that it can do that again. Ryan: Well, yeah, it can’t go lower than 0%, or can it? I’ve heard stuff about – I don’t really understand it – but, like, negative interest rates in other countries. Is that something that the reserve bank could do? Steve: They can and it’s insanely stupid. Ryan: And why is that? Steve: Because you have to think about this in double-entry bookkeeping terms. Ryan: Okay. I don’t know if I’m going to be able to understand those terms. Steve: Economists do not think in terms of double-entry, which is a big mistake. But I do, which is why I’ve got some of the different approaches that I’m talking about now. But if you think of double-entry bookkeeping terms, you’ve got assets and liabilities. And your loans are an asset for a bank. And so are your reserve accounts you have at the central bank. Now, at the moment, the central bank pays you no interest on the reserves, so you’ve got an income earning asset, which is your loans and a non-income asset, which is your reserves. Now, when the central bank says they’re going to change negative interest rates, what that means is, they start giving banks a negative return on the deposits the banks have at the central bank. So the banks now have got 2 assets. Loans earning a positive return and reserves earning a negative return. So what’s the banks’ response that is going to say, well, we’ve got a negative return from one asset. The only way to compensate is to get a positive return from the other asset or a bigger one. So if we get negative rates on our reserves, let’s increase our mortgage rates and that’s what’s happened in Switzerland. Ryan: Well, that’s the thing. Say, I’ve got $10,000 in the bank and I’m getting paid by the bank for it 3% or 2.5% or whatever they’re giving at the moment. And say, in the future, that that becomes negative and I’ve got $10,000 in and they’re charging me 1% or it’s -1%. Of course, I would rather take that money out, keep it in the sock under my bed than leave it in the bank. So, I understand why they wouldn’t want to do that. Steve: That’s what the economist and all these central banks, their mind is infected with neo-classical economics, which is the main reason I’m fighting all this stuff, the nonsense theory of capitalism. With that thinking, they actually believe that people would be encouraged to spend by the negative rate rather than take the money out of the bank. Ryan: And just keep it. It seems like such logic, though. Like, just put yourself in that position. If you had X-amount of dollars in the bank. Just because you’re getting a negative interest rate, doesn’t mean you’re automatically going to spend that money. You might just take it out. Steve: I know. Yeah, take it out of the bank, which you’ve got the option to as having cash. You can go to the bank and say, “I don’t want to deposit anymore, thanks. I want to hang on to my savings in cash.” Because banks themselves are realistic enough to know that, when the banks – the central bank makes the policy change to send a negative rate. The private bank looks at it and think, “Well, there’s 2 ways we can cope here. We can actually charge our own depositors and that’ll make them stampede to the other banks. Or, we can charge extra money to our borrowers, put up mortgage rates. They can’t get away.” And that’s what happened in Switzerland. When they made the rate -0.5% mortgage rates were increased by 0.5%. Ryan: Yeah. So it actually has the opposite effect to what they were hoping for. Ryan: So interest rates could potentially, from the Reserve Bank, go down to 0%. Is that the only thing that could continue to stimulate house prices from going up and how long will that extend things for, like 2 years, 10 years, what are we talking? Steve: That’s maximum 2 years. Because the reserve’s always been totally dragging its chain on interest rates because it’s always believed that the biggest danger facing the economy is inflation. So the Reserve Bank was the very last bank to stop raising rates when the global financial crisis hit. And the very first central bank to start raising them after it in the false belief that it was all over and all behind us and didn’t really happen in Australia anyway. So they have always been making things worse rather than better. And that’s what I think they’re going to do this time again. Ryan: Okay. Cool. We might close it off there to respect your time. I guess, what I’ve taken away from this is that – and you can correct me if I’ve had any mistakes here – but that the acceleration of increasing mortgage debt is a major of the growth of property in this country. As that growth decreases in terms of acceleration, so it’s not growing as fast, then that is going to affect house prices. What can be done to avoid house prices dropping as that occurs is the Reserve Bank could drop interest rates to continue that acceleration, but then eventually, we’re going to hit a point where that continuation can’t occur anymore. Mortgages will stagnate, which will lead to house prices crashing. Did I kind of catch that? Steve: You pretty much nailed it, yup. Ryan: And then how do you work out that house prices are going to drop like people say 40% or 50% or 80% in some areas? How do we get those figures? Steve: That’s really, in some ways, working from experience what happened when other bubbles burst. It varies from country to country, obviously, how far it will go. America’s prices fell 40% before they started to recover. Japan prices down over 70%. England prices fell and rose again, which can happen because acceleration is quite a weird bee, so mortgage debt is still falling, but house prices are rising, the acceleration’s actually positive in England. So it isn’t a given, but compared to other bubbles around the world, the only bubble that compares to ours in the past is the Japanese bubble. I don’t see us having that big of a fall, but I see 40% as being modest in terms of thinking of how far it could fall. Again, the one wildcard here is Chinese buying. And as soon as there are problems with house prices, I can see the Australian government reversing its current attempt to stop overseas purchases and encourage them back again if it keeps house prices rising. So I can see them doing that. Ryan: Okay. I guess there’s more at play here than just mortgage rates of Australians. We’ve also got to take global economy into effect and other countries like China investing in Australia. Steve: And politics in China. Because if the Chinese continue to want to get their money out because they’re afraid of a collapse in their economy and the crack down by the communist party, then we can get flooded with money. If the communist party cracks down successfully, people could be forced to sell their properties over here. So the final gamble people are making is what’s going to happen in China. That’s a pretty big gamble. Ryan: That is a pretty big gamble. We’re talking about another country’s government making a decision that could affect our property prices here in Australia. Ryan: Okay. Wow, I’ve learned a lot from this. I really appreciate you for your time and taking the time to share your knowledge with the audience and I’m sure a lot of people will be enlightened and will want to look into this in more detail. Where can they go to get more information whether it be from you or are there sources that you recommend that people can go to learn more about this or to keep tabs on things like the accelerating mortgage debt and that sort of stuff? Steve: Okay. I’ve got a blog site called debtdeflation.com/blogs. I also publish a column in Forbes magazine. I do it fairly irregularly because I’m too damn busy. So those are 2 possible sources from me. The best source to look at to compare data internationally is the Bank of International Settlements, which publishes 2 databases. One on lending, including government as well as private debt across 41 countries. And the other being house prices across about 50 countries. So that’s the best comparative data source you can find. Ryan: Is that available to the public? Steve: Yeah. It’s freely downloadable. You go to Bank of International Settlements and just search. Very quickly, you’ll find what they call total credits of the private sector. And that’s a huge, huge database. Very, very comprehensive database they just put together in the last year. Ryan: Do you think if I went to read that, I would understand what I’m looking at? Or, will it be a bunch of mumbo jumbo? Steve: The trouble is the database, it’s a spreadsheet. If you download the spreadsheet with about 1200 rows and about 250 columns. So I’m analyzing that for a book I’m writing right now, which will be coming out in September. I’ve got a few articles about that on my blog in the meantime and that will give the analysis of the whole thing. Ryan: Okay. So, I would probably say the best place people can get information will be to go your blog and to get your analysis of it. And so, what was the address of the blog again? Ryan: Okay, cool. I will get people to go ahead and check that out. Thank you so much for the time. I wish you the best with your book launch in September. I just really want to thank you that you’re willing to stick your neck out there and say something so controversial and something that is against what most banks or most governments, most people would want you to say. I applaud you for your willingness to do that. Steve: And I applaud you for listening. It’s unusual that property blog would do that. Ryan: So I hope that you enjoyed that episode with Steve Keen, who is an Australian economist currently living and working in London. He knows this issue like nobody else. His ideas are controversial in the market, not everybody agrees with him. For me, the book isn’t closed on this subject. I think that Steve makes some great cases. I think that the data that he provides is very convincing. It was very hard to understand at first, but once I began to understand it, very convincing that, yes, property prices have been going up as a result of increased mortgage debt and that as this slows down, then that could cause a property crash. So that’s definitely something that I am more aware of now after talking with Steve and I hope that you are, too. And this is something that I’ll be exploring. I’m going to try and get some more experts on to talk about this in more detail so we can understand everything that’s happening, but this is definitely something that I will take into consideration when investing in the future. I’m not saying that, yes, I 100% agree that the property bubble is going to crash, that I wouldn’t invest in property, but I am saying this is definitely a possibility that you need to consider when investing in property. Because if you’re investing in negatively geared properties hoping for capital growth forever and day, that might not happen. And what if Steve’s right? What if in a few years, the market does crash and you’ve invested in negatively geared properties for capital growth and all of a sudden, you’ve got a property that is worth less than what you paid for it and you have to pay every single month because the property is negatively geared. It kind of reinforces what I’ve been talking about for years, anyway, which is one of the benefits of positive cash flow property is that you can continue to make money in whatever market. Steve talked about how rents don’t change as much when there’s a massive property crash. Yes, they do decrease, but unlikely as much, because rents are more directly correlated with the income, rather than with how much people can borrow. So that was exciting to hear for me talking about positive cash flow properties for all these years because if we are preparing for this situation, if the property market does crash or does go down, whether a burst and we’re losing 40%-50% in a very short period of time, or maybe it stagnates or maybe it drops slightly. If we got positive cash flow property that is generating us income, hey, at least we can afford to pay our mortgage and hopefully we’re still making a profit on top of that as well. Whereas people who are solely reliant on capital growth won’t be in as good a position. So, positive cash flow, at the moment now when everything is growing, everyone kind of puts positive cash flow to the side and says, “Well, that’s not really a viable strategy. I can make $100,000 in a year by investing in the growth market that just happened in Sydney.” And they’re right. Look, if you can consistently get those sorts of capital growth, then good on you. But there is a risk associated with it. And so, look, I really appreciate Steve for basically sticking his neck out and speaking out against government. Speaking out against banks. Speaking out against lenders and all of this sort of stuff because chances are, not many governments or institutions are probably liking what he’s saying and liking that he’s calling them out on this sort of stuff and making them seriously look at it. So, definitely, I applaud you, Steve, for your courage in that. I hope that this has been interesting for you, guys, and that you have learnt something along the way. And this is something I will discuss more and more. If you have questions, please head over to the blog at onproperty.com/371. That’s where this episode will be located. There’s a comment section down the bottom. If you scroll down there, you can ask your questions there and I’ll try my best to get back to everyone and see if I can answer these questions. But, yes, this is something I’ll be exploring more into the future and thanks again to Steve for sharing your knowledge and for sharing your time to enlighten and to educate the On Property community. So, that’s it for today, guys. Until next time, stay positive.